On April 29, 1906, This miraculous image of Our Lady wept in the Jesuit School of San Gabriel, Quito, Ecuador. Both Jesus and Mary have wept in the course of actual apparitions to certain persons. Both the tears and sadness of Mary and her Son have been witnessed by certain persons, as also words of Christ and Mary telling of their tears or sadness. One can find such instances in the author's earlier books. Here however we wish to limit ourselves to commenting on images that have been seen to weep. Sacred images have wept or bled in the past history of the Catholic Church, but never in such numbers and variety as in our own times. Two of the first of these are a picture of Our Lady of Quito which wept in Ecuador, April 20, 1906, and a head of Christ which wept in Spain at Limpias near Santander . Since then several replicas of that head of Christ of the Limpias have wept tears of water or blood. More recently, a pure plaster image of the Immaculate Heart of Mary located in a home at Syracuse, Sicily, began to weep copiously on Aug. 29, 1953. The Little Madonna, Madonnina, wept on and off for four days. There is a great shrine there today visited by multitudes of pilgrims. It is significant that this weeping took place in the home of a poor couple, the Jannusos, in an area called "Hell Row". It is also significant that the wife, Antonietta was cured at that time of an unusual malady, as were several others and that many "Catholic Communists" returned to their faith and went to confession. 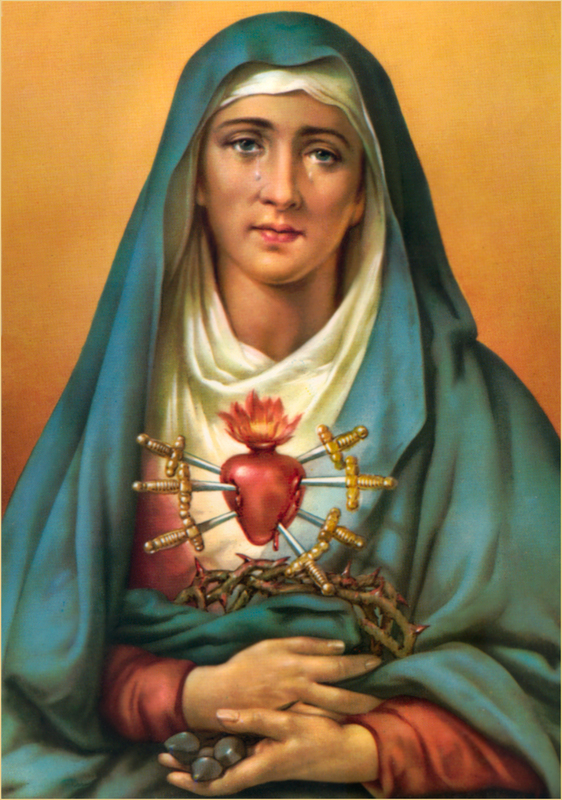 Again, it is significant that the image shedding tears was that of her Immaculate Heart, a reminder that at Fatima she said that Russian Communism would be defeated and that, "in the end my Immaculate Heart will triumph." This event seems to have ushered in a whole series of similar weepings and shedding of blood. Although there were scattered weepings of images before and after Syracuse, a flood of tears began in the seventies, especially in Italy and the United States. We merely mention places in Italy where such weepings have occurred and been photographed; Maropati, Porziano di Assisi, Cinquefrondi, Lendinara, Naples, Porto San Stefano, Ravenna, Vertora, and Firenza. Various sacred images of Teresa Musco, a stigmatist who lived in Caserta, Italy, wept tears or shed blood in 1975-76. These include an image of the Immaculate Conception, a head of Christ in agony, a Sacred Heart statue, a crucifix, and two images of the Infant Jesus. 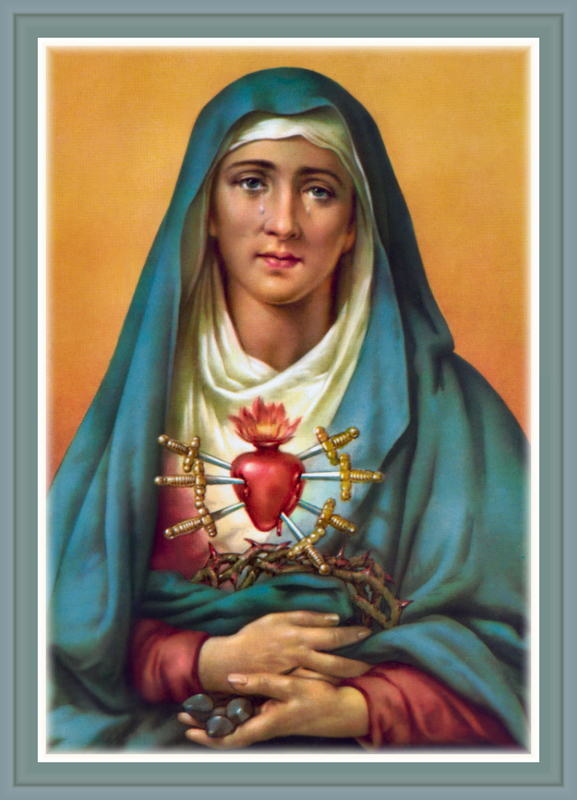 A statue of the Sorrowful and Immaculate Heart of Mary, associated with her brother, shed blood from the heart. Elsewhere Fatima Pilgrim Virgin statues wept in Haiti, Damascus and Viet Nam. A Marian statue wept in Poondy, India, and another in Madrid, known as "Queen of Victim Souls and Mother of Priests" bled from the eyes and heart eleven times. A statue of "Our Lady of All Peoples" wept 101 times in Akita, Japan, where the local bishop has declared the revelations given there as worthy of credence. The Rev. Joseph G. Breault, O.M. V. was the third official custodian of the North American Fatima Pilgrim Virgin statue. He related years ago about all the weepings of this statue that he had witnessed but for brevity we quote from a statement of his in Soul magazine. "I have seen that statue shed tears at least thirty times and I can resign myself to being separated from it only because I have 160 seminarians to guide in their spiritual formation." Outstanding weepings of this statue occurred in 1972, at New Orleans, Atlanta and on Long Island. The second International Fatima Pilgrim Virgin statue wept at Las Vegas, January, 1978, on three different days, and at Carthage, N.Y. May 4, 1980. When the North American Pilgrim Virgin statue stopped weeping in 1972, the Polish exile " AW" received an Immaculate Conception statue that wept eight times, a thorn-crowned head of Christ that wept and bled, and a Fatima statue that wept over 50 times. The latter's weeping sites included N.Y. State, Washington, D.C., Wheeling, Chicago and Pittsburgh. In late 1972, when "AW" had been associated with the weepings of the North American Pilgrim Virgin statue, and when her own two statues had wept plentifully, the Blessed Virgin said: "I have buried them in signs." In June 1975, the first Fatima statue of a Cuban exile from Communism, whom we name as "CE," began the first of 50 weepings or so in the New Orleans metropolitan area. Afterwards a statue of the Sacred Heart of Jesus, one of the Immaculate Conception, the Corpus on a crucifix, and a Head of Christ image, all belonging to "CE" wept or shed blood. In 1976 "C" 's first Fatima statue was placed permanently in a chapel and a second Fatima statue became his "Pilgrim Virgin". It also has wept many times, including a special sequence of weepings in 1980, at the conjunction of the feasts of the Sacred Heart of Jesus and the Immaculate Heart of Mary. This was the fifth "anniversary" of the first weepings of his first Fatima statue. It is evident from our above review that Mary has worn herself out, drained herself as it were of tears and blood, in an effort to move mankind to conversion and repentance. And all the more so for her Son Jesus! Yet these weepings of the 19705 have only increased and spread through the world in the 19805. First we shall look at weepings in countries around the world and then in the U.S.A. and Canada. Then we shall look at otherwise animated images. In most cases we have to be summary and unfortunately omit many dramatic incidents. In the eighties the most frequently reported weepings are those of Rosa Mystica statues. The statues originate from the private revelations to Pierina Gilli of Montichiari-Fontanelle, Italy. Claims for as many as 100 separate statues weeping have been made, but there is no doubt that they have wept in large numbers. A few cases of bleedings have been reported as the one photographed at Brescia, Italy. One of the first to be well publicized was that of the Rosa Mystica statue in a home in Maasmechelen, Belgium, which began weeping Aug. 3,1983. Actually the first Rosa Mystica statue to weep in that area [in connection with Hamond monastery], wept Sept. 15,1982, as also did a small Fatima statue. In a second Belgium home, that of Florice Ivens-Albert Lemucke, in Montenaken, a Rosa Mystica statue has wept a number of times recently. At Montichiari-Fontanelle itself, several small statues wept during processions in November, 1985. One wept so hard the pilgrims witnessing it wept also. On Dec. 8,1985, the Feast of the Immaculate Conception, a wooden Rosa Mystica statue wept. It is my impression that one or two of the statues standing by the shrine and miraculous pool at Fontanelle have also wept. Also one kept in a religious article store in Montichiari. In Dublin, Ireland, in a southside working-class home, a 27 inch Rosa Mystica statue wept over a six-day period, beginning May 25, 1987. The same statue also wept in a convent hall, witnessed by twenty persons gathered there. A similar Rosa Mystica statue wept in North Dublin in two homes of a middle class area. It wept for three days in one house, and in the second home off and on with prolonged weepings [Ave Maria]. Another Rosa Mystica statue has wept in Cork, Ireland. In Egypt a Rosa Mystica statue has been reported as exuding oil for some years. [Opus Rosa Mystica, Essen, W. Germany, Oct., 1987]. In Sri Lanka, a Rosa Mystica statue was taken to the home of a Mrs. E. Femand, Colombo 7, and wept there. "I almost wept myself when I saw Our dear Lady weep. It will be something I will always remember as long as I live." Cures occurred as this statue was circulated. Statues of the same title have been reported as weeping in France and Germany. A blind girl is reported to have received her sight in the presence of others, themselves in prayer and fasting. These are the times of the great chastisement and purification." "We're passing around our large statue of the Mystical Rose each Sunday. We take Her to a different home so they can share their veneration of Her. We got a call just yesterday from a lady who has it this week and she said that 'She is weeping.' I told her she'd better fall on her knees and say the rosary. It seems that several of the people that we've 'loaned' Her to have said this. It is beautiful!" This particular lady and her family were privileged to see the Rosa Mystica statue of Marie Linden in Maasmechelen weep twice in 1984. A man who organizes pilgrimages had a 19 inch Rosa Mystica statue which gave off the scent of roses on seven occasions. Its eyes were seen to grow large as one walked away from it. We might ask here why have so many images under the title of Rosa Mystica wept in the eighties? Primarily these phenomena call attention to Our Lady, The Mystical Rose and the Montichiari-Fontanelle revelations. This seems to involve a more spiritual expansion of the basic Fatima message. It is a call to increased and more intense spiritual life, and especially in the realm of priestly and religious vocations. It is an important part of our Lord's and Our Lady's plans and strategy to bring the Church through the apocalyptic times foretold at Fatima. It is only the perfection of spirituality, as exemplified in Mary, the Mystical Rose which will bring this about. A statue of Our Lady of Grace also shed tears of blood in Lebanon. On Feb. 4,1986 in the Blue Mountains area of Australia, a little statue of Our Lady of Lourdes seeped oil from hands and feet and the oil continued running until May 21, 1986. Evidently this was meant to remind us of Mary's sufferings at the Cross as inexplicable bruises and discolorations also appeared on her face. We must note here that a number of sacred images have exuded oil; and cures are reported from the use of such oil. To some, such a phenomenon may seem strange. However, oil has always been associated with healing as with giving tight. Also, oil is easier to handle than blood, and blood used for anointing would certainly put people off. Further, especially when coming from a crucifix, oil may stress that the wounds of Christ from which flowed his precious Blood are a powerful source of heating, especially for the ills of the soul. We might recall here that a statue of Our Lady of Zose, Shanghai, China, wept for three days in 1953. Either that statue or another one of Mary wept in China several years ago. And bear in mind the statue in Akita, Japan, Our Lady of All People, wept 101 times. In South Korea, a lovely tittle statue of Mary has wept regular tears and has also bled. Tears of blood were shed on Oct. 19,1986. The statue has shed many tears during 1986. Both clear tears and tears of blood occurred on Oct. 25,1986 and on Feb. 2,1987, and likewise on April 23, 1987, when this continued for seven hours. Messages were connected with the weepings. One message said Mary was in pain over the way her priests were being treated. In India, at Little Mount, Madras, the family of S.F. T. Roche prayed family prayers and the rosary daily for 25 years before a Lourdes statue. On May 29. 1985 the statue's eyes filled with tears. When the mother of this family witnessed this miracle, she consented to the wishes of her two lovely college graduate daughters to enter a strictly cloistered convent. Before the weeping she had opposed their entrance to so "strict" an order. After the weeping she was happy for them to enter a Poor Clares convent of perpetual adoration. After Mary's sorrowful look and tears the statue smiled. In the Valparaiso area of Chile, South America, an image of the Blessed Mother wept on act. 25, 1984. Another Marian statue, it seems of Our Lady of La Salette, also wept there. One suspects that a Rosa Mystica statue was also in the area because Mary asked at the time of the weeping, that a red, a white, and a yellow rose be picked from the garden and her tears on the statue be wiped away with their petals. Which seemed a way of her saying that devotion to her as the Mystical Rose can take away her sadness. A spotlight revealed the eyes of the statue to be swollen with crying and its small face full of sadness. In Granada, Spain, a statue of Mary reportedly shed tears of blood and Mary is said to have told the seeress, Rosario, "It is not my blood, it is the blood of the world." In England, on Aug. 4, 1985, a statue of Our Lady of Fatima was seen to cry. In Montreal in 1985, a Marian statue of Jean-Guy Beauregard in the home of Maurice and Claudette Girouard is reported as having teared blood and a rose-scented oil. The blood was analyzed as human blood. In Puerto Rico, in July 1983, a statue of Our Lady of Sorrows in St. Joseph church in Arbonito wept in the presence of many people. In early 1987 "CE," the Cuban exile, found his second Fatima statue and other statues of his weeping copiously. Almost in desperation he cried out to the Blessed Virgin, "Why so many!" The reply from Mary was that it was because all Heaven was weeping over the sins of mankind. "CE" and " AW," both exiled because of Communism, continue their separate missions to fight Communism with the Fatima message. THE MIRACLE OF DAMASCUS, The Publican, 1989, with Imprimatur.